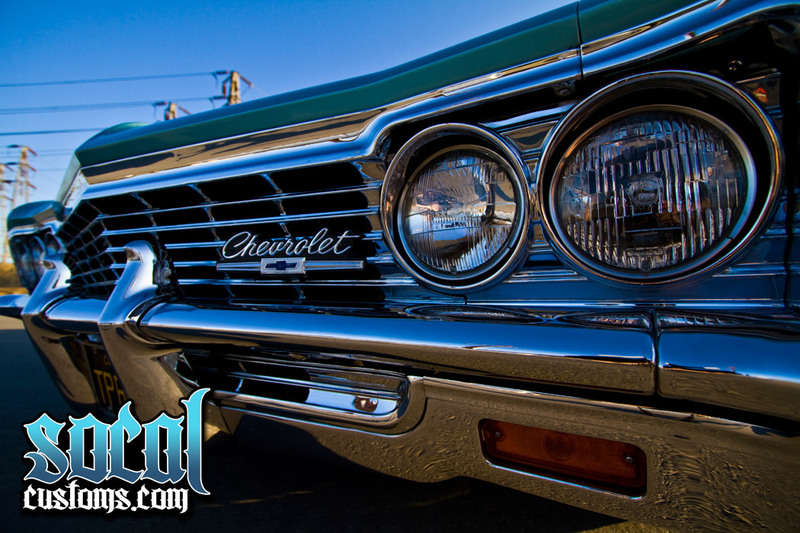 Every vehicle has a history. 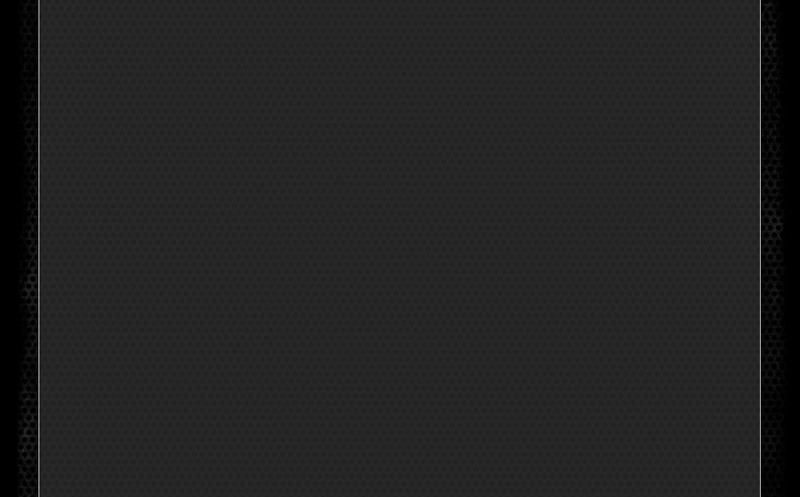 Some are riddled with stories and others are relatively eventless in their decades from then to now. 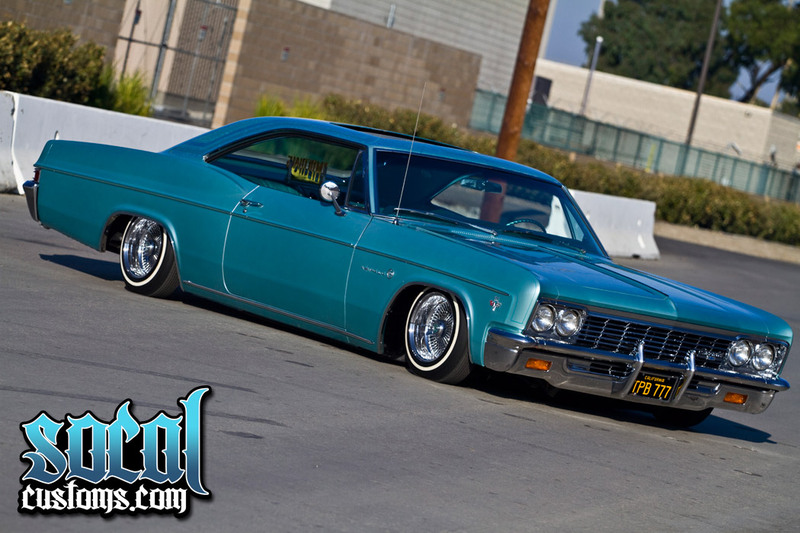 Junior Garcia from Garden Grove, California owns this 1966 Chevrolet Impala that was purchased from the original owner 13 years ago. 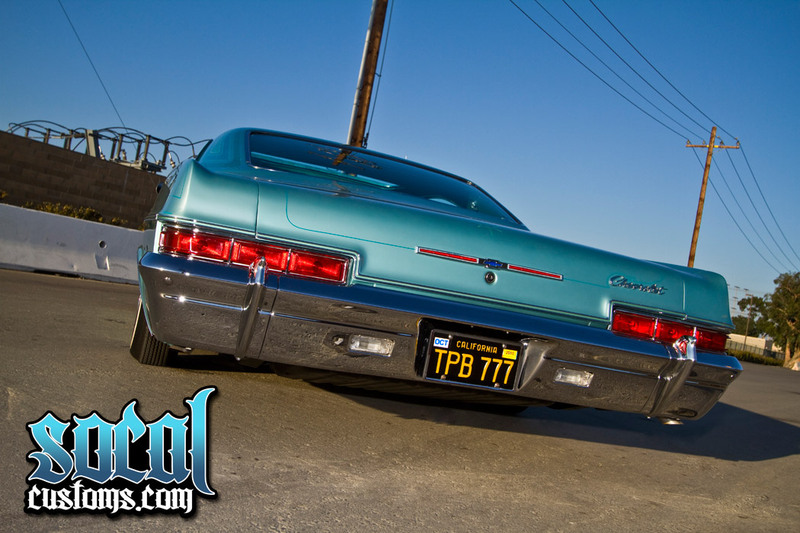 The car was purchased in 1966 and was taken care of by its owner. 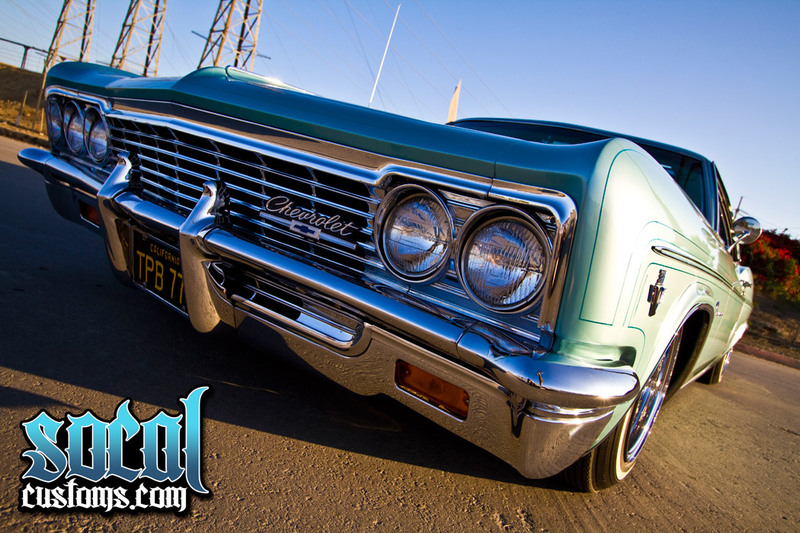 It remained in factory condition with some wear and tear that can be expected in a car that was over 30 years old at the time Junior purchased it. 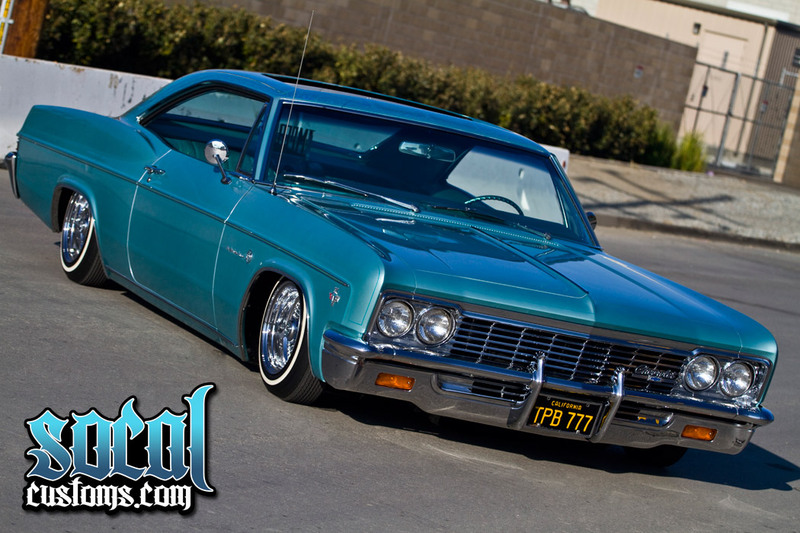 Now in the 44th year since its release, this Impala has been modified in lowrider style but still remains a very clean example of what can become of a car that was built before most of this websites visitors were born. 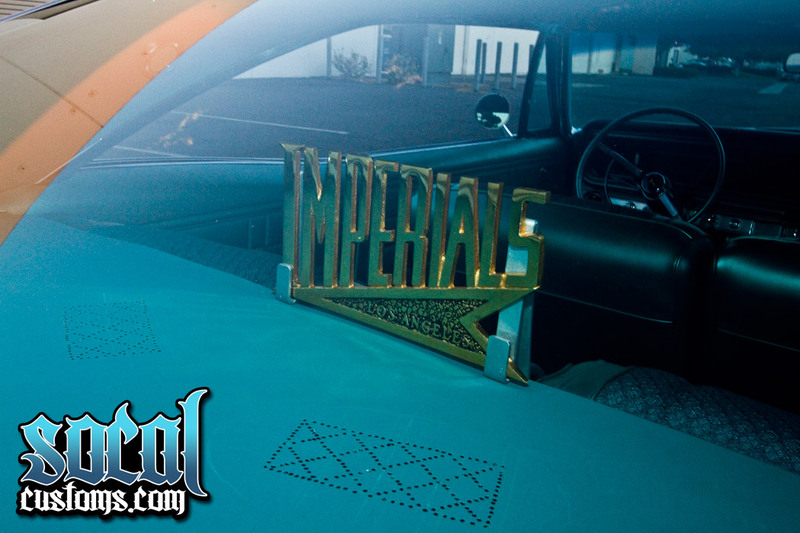 Junior is also a Member of the Imperials Car Club. 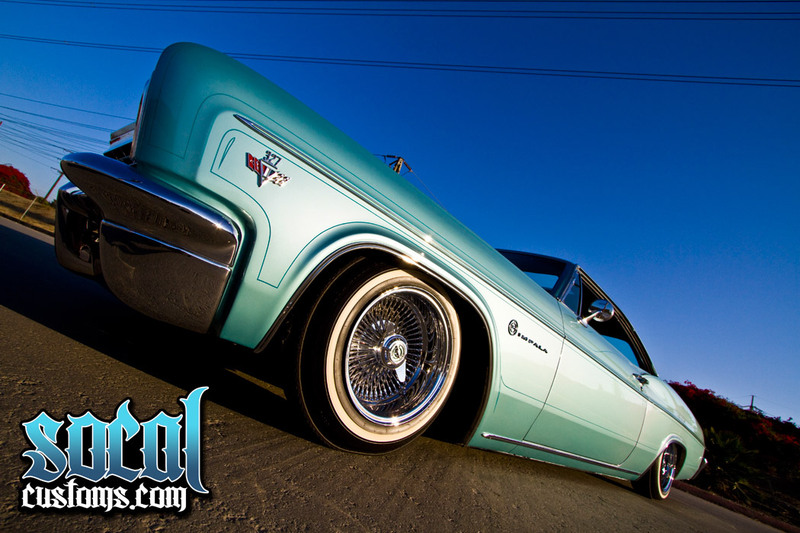 The Club is coincidentally celebrating its 45th anniversary in November as an active lowrider car club. 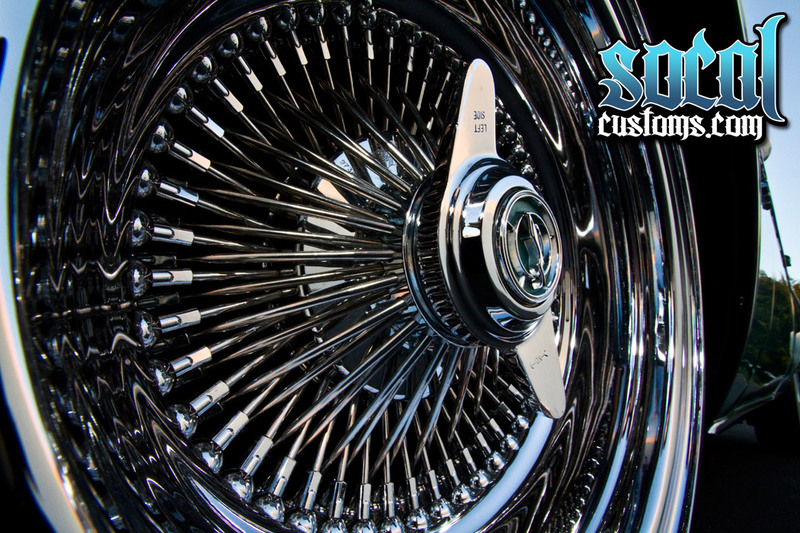 That is a long run of modifying cars, building friendships, and representing your niche in the automotive scene. 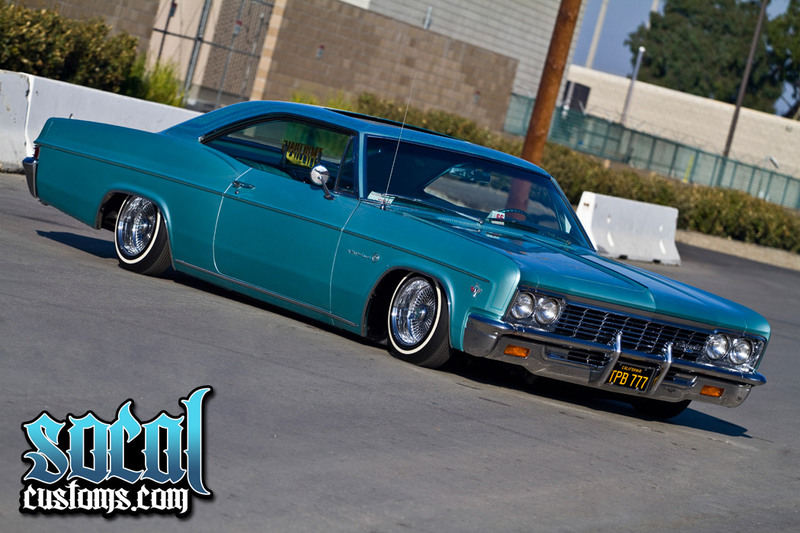 The term "lowrider" is pretty self explanitory and this Impala needed to get a lot lower to be considered in that category. 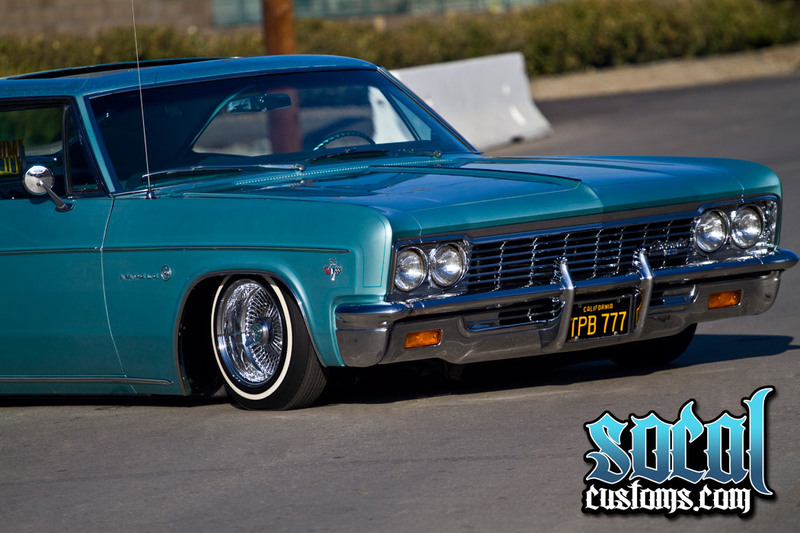 So Junior contacted Richard at Evergreen Hydraulics for a 2 pump, 4 switch hydraulic system that lays the body down over the 100-spoke wire wheels and whitewall tires. 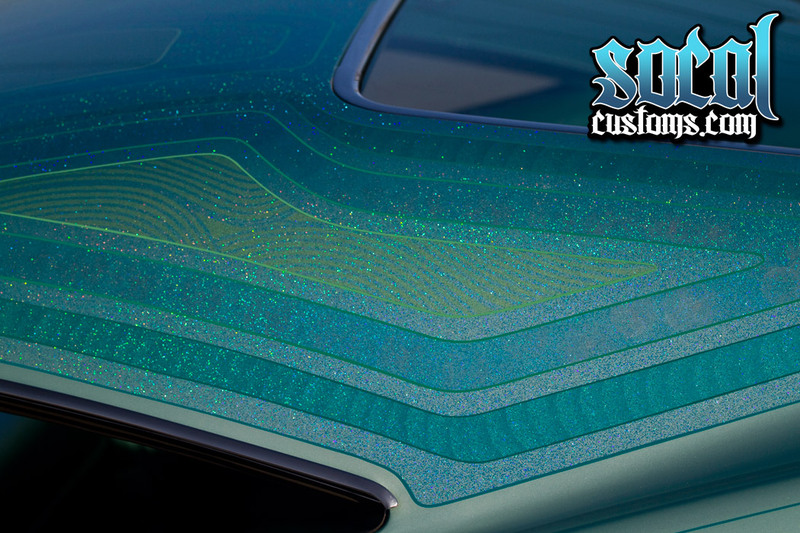 The body of this Impala was prepared for its new paint scheme so that Edgar at Choice of Colors in Santa Ana, California could lay down the Artesian Turquiose Pearl with multi-colored patterns and metal flake that is very cool in bright sunlight. 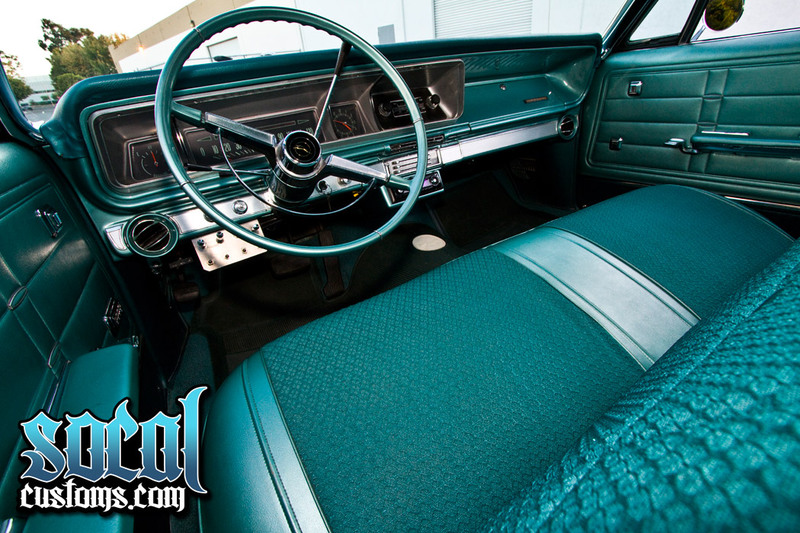 The interior looks relatively stock because Junior turned to Cars1 for a stock 1966 Impala interior kit to restore it to the factory look Jesse Valadez at AJ's Upholstery in Garden Grove, California installed the kit and as you can see, no otherupgrades were needed in this cool, comfortable cabin except some audio which comes from a Kenwoodhead unit 6x9 speakers. 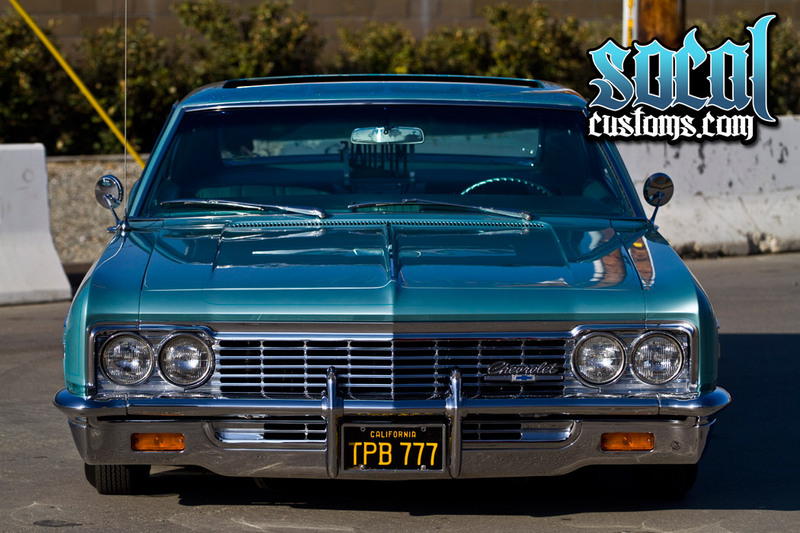 The Chevy 283 motor with 3 speed turbo transmission was also left fairly stock except for some major cleaning and a chrome dress up kit to accent it.